The Brittany Spaniel is an energetic, light-boned medium-sized dog with a lightly feathered single coat and remarkable speed and agility. It has an alert and eager expression, with fairly heavy eyebrows. Excellent hunting dogs, the Brittany's smaller size allows them to go where larger dogs cannot. The Brittany excels at pointing and retrieving both on land and in water. 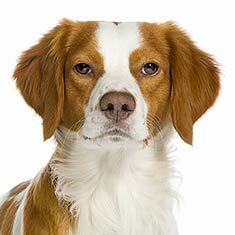 The Brittany Spaniel originated in France. Brittany Spaniels range from 17 inches to 21 inches. Brittany Spaniels range from 30 to 40 pounds. Brittany Spaniels are typically black and white, orange and white or liver and white. 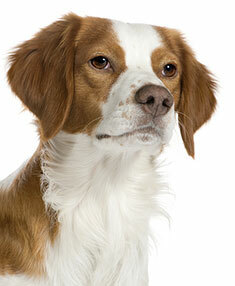 The Brittany Spaniel has either a straight or slightly wavy coat. Regular brushing is required to keep the coat in good condition. The Brittany is a highly energetic and friendly dog breed. They are good natured and do well with children and other pets. The Brittany is susceptible to hip dysplasia, skin problems and seizures. The expected life span of the Brittany Spaniel is 12-13 years. Brittany Spaniels are a very energetic dog breed and therefore do well in a home with a fenced yard. An active owner is essential for this dog breed, since Brittany Spaniels tend to get nervous if not given plenty of exercise. The Brittany Spaniel is in the Sporting group. The Brittany, often referred to as a spaniel, is actually closer to a pointer or a setter. True spaniels are used to flush out game, while the Brittany is more of an all-purpose sporting dog. They are particularly suited to bird hunting, having been developed in the Brittany province of France for just this purpose in the 1800s. The breed excels at pointing as well as retrieving both on land and in water. The athletic Brittany is a versatile hunting dog. What does a Brittany look like? As you might expect given his purpose, Brittanies are quite athletic. Their solid, compact bodies include long legs, giving the dog a long elastic gait. Although a Brittany may have either a long or short tail at birth, those with long tails generally have them docked to a length of 1 – 4 inches. Fully developed, the Brittany will stand 17.5 – 20.5 inches high at the withers and will weigh between 36 and 43 pounds. In America, black-coated Brittanies are not acceptable in the show ring, although they are in other countries. Colors acceptable everywhere include orange and white, liver and white, orange roan, and liver roan. Brittanies may also come in tri-color, but this too is a disqualification in the United States because one of the three colors is black. Breeders are currently trying to change the breed standard in America to include black, arguing that since black is acceptable in the dog’s home country of France, it should be acceptable everywhere. The Brittany’s handsome good looks are sometimes confused with several other breeds. The most common of these “twin” breeds is the English Springer Spaniel. 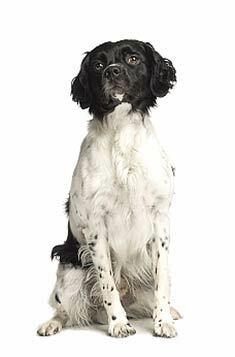 Others are the Welsh Springer Spaniel, the English Setter, the Cocker Spaniel, the Australian Shepherd, the Border Collie, and the English or German Shorthair Pointer. The coloring is similar in many of these breeds, but the ears of most of them are larger than those of a Brittany. Overall size is also important in determining the breed. The Cocker is quite a bit smaller than the Brittany, while the Pointer and Setter are much larger. A major consideration when deciding if the Brittany is the right dog for you is exercise. This breed is very active and needs room to run. You must provide for the dog’s physical activity, as well as mental stimulation. The dog will enjoy hiking, swimming, and agility competitions, if you are not a hunter. If you fail to provide the proper opportunities for exercise and mental stimulation, your Brittany is likely to become hyperactive, chewing and barking excessively. You must have a fenced yard to keep the dog safely at home, and you must be willing to give the dog personal attention every single day. Can I leave him home alone? Brittanies are very sensitive and require companionship and love. In fact, separation anxiety is one of the key problems people have with Brittanies. They are very social animals and will behave badly if not given enough attention. If you have to be away at work all day, you will likely come home to chewed furniture and neighbors complaining about the barking that didn’t stop all day. If you are unable to meet the breed’s ongoing requirements for attention and exercise, you might be better off with another type of dog. You can be sure your Brittany will tell you if he is not getting enough attention – he will simply begin to chew your stuff until you remember he is around! How do I groom my Brittany? One good way to interact regularly with your Brittany is to spend time grooming him. Although there are no extensive grooming requirements for the breed, you will need to brush his coat at least once a week to pull out dead hair, especially in the spring and fall. Bathing is only required when brushing does not restore the coat’s original luster. The only other grooming needed is to make sure the dog’s toenails do not become too long. This can be accomplished by walking the dog regularly on concrete surfaces, or by trimming the nails regularly. Long nails are uncomfortable for the dog and become a liability, as they may be torn off. What health problems do Brittanies have? The Brittany is overall a healthy breed with a life expectancy of 12 – 14 years. Most of the problems you might see in Brittanies are the same as you would see in any other breed, such as luxating patellas, hip dysplasia, and genetic eye diseases. Luxating patellas occur when the kneecap slides out of position, causing pain and arthritis in the joint after exercise. This is most often treated surgically. Hip dysplasia occurs when the top of the thighbone deteriorates, causing looseness in the hip joint. Various treatments are available to relieve the dog’s pain, but care should be taken when choosing a puppy that both parents are certified by OFA (Orthopedic Foundation for Animals) standards to be free of hip problems at the time of breeding. In addition, you should look for certification by CERF, the Canine Eye Registration Foundation, which assures you that the sire and dam are free from genetic eye diseases. The Brittany is a great addition to any family. His versatility as a companion, hunter, and / or show dog allows him to fit in anywhere. His delightful personality will make him the love of your life in no time, as long as you are willing to provide him with the exercise and attention he needs. Find Brittany Spaniel Puppies with our Free Breeder search!